Palace Cafe: The Flavor of New Orleans tells the story of a restaurant, a city, and the Brennan family. Featuring home-cook-friendly recipes, serving tips, and sample menus. The color food photography and stylish black-and-white photos of this nationally acclaimed French Quarter restaurant make this book a delight to both the eye and the palate. Traditional New Orleans cuisine with a fresh approach makes any dish served at this restaurant something worthy of trying at home. Unpretentious, but innovative, Palace Cafe’s style of cooking uses fresh regional products and is full of that flavor for which this region is so well known. 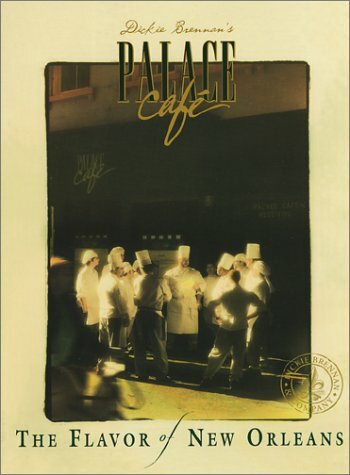 Palace Cafe has received many awards, from Best New Restaurant by Esquire magazine and USA Today in 1991 to the prestigious Ivy Award from Restaurants and Institutions magazine in 1997. The restaurant has also been featured in the New York Times as the headlining place to eat while in New Orleans for Mardi Gras. Palace Cafe is popular with residents of New Orleans and visitors alike for brunch, lunch and dinner, served seven days a week, and not a meal service goes by that someone doesn’t request the recipe for a dish. Dickie Brennan and his family always keep copies of the most requested recipes available at the front door. Palace Cafe: The Flavor of New Orleans brings them all together, plus many more. The willingness to share so much comes from the strong sense of family that the Brennans have. “In a family this size, there’s no reason and no way to keep anything a secret. There’s no real point,” says Dickie Brennan. The quality of service and beautiful atmosphere at Palace Cafe, along with extreme talent in the kitchen under the care of Executive Chef Gus Martin, has visitors returning, even if they themselves have mastered the recipe for a dish such as White Chocolate Bread Pudding. “Cooking is fun. It’s what we do. We only hope to be able to pass some that joy on to others,” says Chef Martin. With over 170 recipes included, Palace Cafe: The Flavor of New Orleans offers hints on how to make a dish successful, serving tips, and ways to make it more personal by using whatever local products are available. But just in case the original ingredients are important to you, there is a source listed for all of the items that might be difficult to locate in various regions of the country. Not only is this a book about recipes, but it also offers a glimpse into the day of a restaurant. From the chef meetings that take place twice daily outside the Receiving Door, to prepping the food and the restaurant, to presenting the food at the table, you can see what goes on behind the scenes. It also presents some of the historical background for the cuisine that is distinctly New Orleans. Palace Cafe: The Flavor of New Orleans presents an intimate look at the life of a restaurant, a city, cuisine and the Brennan family, while bringing to the table this collection of wonderful recipes. With over 170 recipes, culinary tips and stories from the “first family of Creole,” Palace Cafe: The Flavor of New Orleans offers an intimate look at one of New Orleans’ best restaurants. The book offers an insider’s view of a day in the restaurant business and a snapshot of life in New Orleans. It’s a must for anyone who craves Creole!